Jammu & Kashmir NEET Counselling 2018: Jammu & Kashmir NEET 2018 counseling for 100% State Quota seats is expected to conduct in the month of June. As Jammu & Kashmir is not eligible for 15% All India Quota seats, therefore, all the 100% seats will be filled through the centralized state quota counseling. Through NEET state counseling, MBBS/BDS/BAMS/BPT etc seats will be allotted to the candidates in various government, private and deemed universities/colleges of Jammu & Kashmir. NEET centralized state quota counseling in J&K will be conducted by Jammu & Kashmir Board of Professional Entrance Examinations (JKBOPEE). 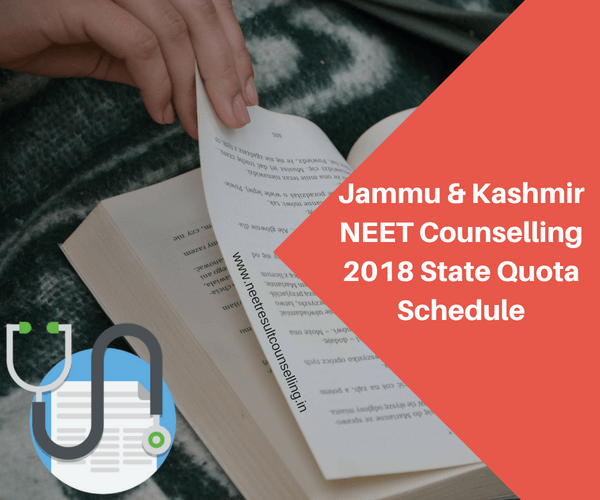 Moving forward in this article you will get all the important information about the schedule, registration, eligibility, procedure etc of the Jammu & Kashmir NEET 2018 State Quota counseling. *Counseling dates given here based on previous year’s data. Official counseling schedule will be updated soon. Candidates must have qualified 10+2 with Physics, Chemistry, Biology / Biotechnology with English as compulsory subjects from a recognized board. Candidates must have qualified 10+2 with Physics, Chemistry, Biology, with English as compulsory subjects from a recognized board. Candidate must have qualified their 10+2 with minimum 50% (40% for SC/ST/OBC) together in all the subjects. Counseling procedure will start from the registration. Candidates have to first register themselves for the counseling. Registration will be done only through the online mode i.e. through the official website of the Board. Candidates have to register by providing all the necessary details. Here, we have shared the reservation applicable on various categories on candidates as per the reservation policy of Jammu & Kashmir. The first and most important step in NEET counseling is the registration. Candidates have to fill an online registration form to be eligible for counseling. Document Verification- After registration candidates have to go through the procedure of document verification. Candidates are required to bring all the documents (originals +photocopies) for verification. Publication of Merit List- After the documents verification, a state merit list will be published. Choice Filling- Candidates whose name will appear in the merit list will be eligible for filling choices for their preferred course and college in the state. Preferences can be filled through online mode or offline mode. Payment of Fee- At the time of filling preferences candidates have to pay Rs.1500/- as counseling fee. Allotment of seats- On the basis of choices filled by the candidates counseling authority will allot seats to the candidates and will publish the result online. Reporting- Candidates now have to report to the allotted colleges along with all the required documents. After the verification of documents candidates will be allotted seats. Admission will be confirmed after the verification of documents at the college level and payment of admission fee. Second Round Counseling- Candidates who will not be allotted any seats in the first round or those who are not satisfied with the allotted seats can apply for second round counseling and can get a seat in MBBS/BDS course. Jammu & Kashmir NEET 2018 counseling will start tentatively in the month of June 2018. Candidates are advised to ensure that they fulfill the eligibility criteria before filling the online registration form. Online registration is mandatory for all the candidates in order to be eligible for counseling. No candidate will be eligible for allotment of seat in any of the round if fails to fill the online registration form. Candidates have to carry all the required documents with an original copy at the counseling venue. Seats are allotted to the candidates on the basis of the NEET score, preferences of the candidates, reservation rules and availability of seats in the colleges.